In this post we’re going to find out whether or not Italian is hard to learn. – The difficulty of learning Italian when compared to other languages. – Some of the most common problems learners face with Italian. – How you can learn Italian quickly and effectively. Italian sounds beautiful, doesn’t it? How cool would it be if you could speak this charming language fluently? But how hard is it to learn Italian? I recently set a challenge for myself which was to learn Italian for two months, just to see how far I could get. This time I didn’t go on an adventurous trip to Italy or anything; I learned Italian online, at home. In this post, we will not only share with you my experiences and the results, we’re also going to break down the language for you and show you how difficult (or easy) it is to learn Italian. I have studied other Romance languages like Spanish, French and Portuguese in the past so hopefully, this is going to give you an interesting perspective. Let’s assume that you’re a native speaker of English or that you speak English very well. What does it actually take to become fluent in Italian? As you can see in the image above, they’ve categorized Italian as a language that is closely related to English and therefore easy to learn. Could you guess all the meanings? Italian vocabulary is even more similar to the other Romance languages. Let’s take a look at a verb –to sing. Some Italian words are very different, but there are certainly enough similarities which will make learning Italian easier for you if you already speak one of the other Romance languages. Another reason why Italian is easy is the pronunciation. Unlike the pronunciation in French, for example, where you pronounce certain syllables in different ways, Italian pronunciation is quite logical. There are certain rules you will need to learn, but these are very straightforward. Don’t you like studying these kinds of tables? No problem, just look at the words, listen to the pronunciation and very soon you will be able to guess how a certain word is pronounced. So why do people say that Italian is difficult? Well, every language has its difficulties, Italian too. We just said that the pronunciation is easy but in order to sound like a real Italian, there are two things that you need to get right. One thing that makes Italian pronunciation tricky is the melody of the language. As mentioned before, the pronunciation is pretty easy, but Italian has a certain melody which makes the language more difficult. In order to sound like an Italian, you not only need to make sure to pronounce the words correctly, you also need to speak with a certain melody. Even Italians often don’t speak using the right melodies and the way people speak varies on the regions so speaking with the right intonation is certainly no easy skill. Just like in Spanish, the Italians roll their r’s. Even though there are plenty of tutorials on YouTube on how to roll your ‘r’, it remains tricky. Learning how to roll your ‘r’ properly takes a lot of practice for most of us who don’t have such sounds in their own native language. Let’s take a look at the preposition in. First, there are two different ways to use this preposition – in and a. The final form of the preposition is determined by the article of the noun that follows after it. Therefore, the preposition will merge with the article of the noun and create a new word. As you can see there are many words for ‘in’ and other prepositions in Italian. Many more than in Spanish or French, so this aspect is definitely more complication than in the other Romance languages. They use the ‘’Subjunctive’’ a lot! The subjunctive is a form of a verb which is used in situations of doubt, desire, opinion, etc. In these instances, you can no longer use the indicative form of a verb which is what you learn first in Italian. You are right. > Hai ragione (indicative). I think you’re right. > Credo che abbia ragione (subjunctive). As you can see, the subjunctive is a completely different form of the same verb. The subjunctive is quite tricky for foreigners to grasp, and it’s one of the more difficult aspects of learning Italian. Also in Spanish, Portuguese and French they use the subjunctive but much less than in Italian. Want to avoid using the subjunctive? I think you’re right. > Secondo me, hai ragione. So is learning Italian harder than Spanish, Portuguese and French? Having had the experience of learning four Romance languages so far, in my opinion, Spanish is the simplest to learn for an English speaker. Spanish has lots of similarities in vocabulary to English, and Spanish grammar is not very difficult as it is also quite similar to English. It is also easy to master the pronunciation in this language. The second easiest for me would be Portuguese. It’s a little more difficult than Spanish because the pronunciation of this language is more challenging, but it is very similar to Spanish in vocabulary and grammar. As far as French and Italian are concerned, I am not sure which one I would choose to put on the third place in relation to difficulty. French can be tricky because it’s not a phonetic language and the pronunciation of this language is the most difficult among the four mentioned languages. However, for all the reasons mentioned earlier, which include articles, prepositions, frequent use of the subjunctive and the unique rhythm, Italian might be just as equally hard (or easy) as French. How can you learn Italian quickly and how long does it take? The languages you can already speak. How many hours each week you devote to learning the language. So, how did I do it and how can you make quick progress too? Make sure that you’ve got the right amount of motivation. Learning any language takes a serious amount of effort. List the reasons why you want to learn Italian. Imagine yourself speaking Italian and become obsessed with your new challenge. Learning Italian becomes more fun when you set goals for yourself and create a plan how you can achieve those goals. Don’t be too ambitious; ‘speaking fluent Italian by the end of this year’ sounds cool but it’s not very specific. Learn the 300 most important words in our Boostcamp. 21 hours of practicing to make sentences with these words (also included in our Boostcamp). Hold a basic 10-minute conversation in Italian by the end of the month. I reached these goals by simply participating in the Italian Boostcamp but you can do it any way you want. For the second month, I would take 2-3 lessons with my friend Stefano on italki and simply practice my speaking skills without any special preparation. Learning first things first is key to quick progress in your new language. The Pareto principle (also known as the 80–20 rule) basically states that you get 80% of results from 20% of work. This principle can be applicable for language learning as well. Languages contain hundreds of thousands of words but only a fraction of them are used on a daily basis by native speakers and only a fraction of those are words are needed for your first few conversations. To create your first few sentences you need words like; I, you, to like, can, to do, today, to want, to be, expensive, big etc. Learning first things first will allow you to make sentences in Italian from the beginning, even after only 5 days! 4. Speak Italian, even if you think you can’t! Using the new words you have just learned in your speech will help you to memorize them better. By speaking, you also find out what important words you are missing and what basic grammar features you need to learn. Speaking a new language is exciting, adds the human aspect, makes it something ‘real’ and is good for your momentum. You need a good teacher or conversation partner who can make you speak with a limited vocabulary. In the beginning, the main goal of your speaking sessions is to simply interact in your target language with the basic words you know. At this stage, it’s not important what you say, it’s more about trying to say something and keeping the conversation alive. The real reason why some people succeed in language learning and others don’t is that some don’t have enough motivation and the willingness to practice the language over a longer period of time. Sometimes it might just all seem to be too difficult, but in fact, it’s only a matter of more practice and exposure to the language. So, follow your game plan and put in the hours. You will be able to make fast progress, especially in the beginning. Now that you’re ready to start to learning Italian, you need to start by focusing on what matters the most at the beginning; learning the most important vocabulary. Italian Boostcamp is ideal for this because it contains hundreds of words and example sentences which will allow you to hold basic conversations from the beginning! So is Italian hard to learn? In conclusion – no. Italian is relatively easy to learn but it does take some time and effort. 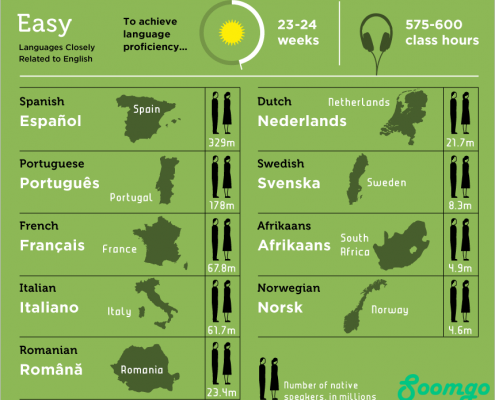 As Italian is closely related to English, I have to agree with the Foreign Language Institute’s infographic shown at the beginning of this article, that says that Italian belongs to the easiest group of languages to learn for English speakers. The tricky parts of the language I have mentioned are not too difficult to master. When you’re driving a car and you want to get to a destination you’ve never been to before, you don’t worry about potential obstacles.